Mood board: Familiar and yet very eerie, Prada’s models ambled around this season like derelict women who had once seen a fancy time with a sailor or two. The marine theme – in the trim canvas caps, sweeping captain’s coats and military jackets – swirled beautifully around the elegant 1930s and 1940s. But there was something dark and sadistic bubbling under the surface of this collection as corsets (or where they straight jackets?) and laced shoes bound the model’s flesh in a menacing fashion. Best in show: When Miuccia gets her melange hat on, no one does better clothes. 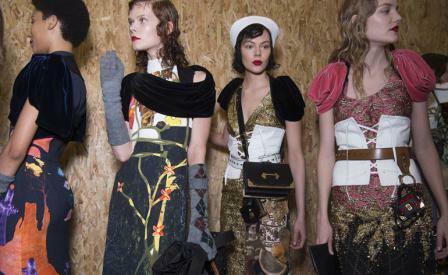 This season she hybrided big brocade party skirts with weird printed landscapes and interiors. Even better was the outerwear including a vintage patchwork knit sweater with astrakhan arms and fox cuffs that was cinched with a huge weightlifting leather belt. Finishing touches: Everyone in Milan has ripped of Mrs Prada’s original formula of droopy thick knit knee socks worn with velvet heeled sandals. She still showed them, but she was one step ahead of the fashion pack with the mini gilded notebooks that were worn on the models’ necks like jumbo necklace charms.